Leo Nocentelli's Rare Funk Gathering featuring Leo Nocentelli (Meters), Bernie Worrell (P-Funk), Doug Wimbish (Living Colour) and Will Calhoun (Living Colour), at the fairgrounds on Friday (first day of Jazzfest.) As always, please make sure to check with the local venues to confirm dates, times and details! Leo Nocentelli's Rare Funk Gathering featuring Leo Nocentelli (Meters), Bernie Worrell (P-Funk), Doug Wimbish (Living Colour) and Will Calhoun (Living Colour) at Tipitinas (Uptown) in New Orleans. Doors 9pm, Showtime 10pm. Rebirth Brass Band also on bill. Tix $25. As always, please make sure to check with the local venues to confirm dates, times and details! Two-time Grammy Award winner Will Calhoun presents "Black Holes" a live world music concert-multi-media event at Performance Space 122 in New York City. Internationally known as the virtuosic drummer/composer of NYC�s rock band Living Colour, Calhoun performs his own live electronic percussion loops, and drums and flutes, as he is joined by poet Louis Reyes Rivera, a nightly guest vocalist, and a dancer performing African dance and ballet. Synchronized images and film from Calhoun�s music research expeditions in Africa, Central and South America move in tempo to Calhoun�s rich sonic tapestry. Click here to view postcard. 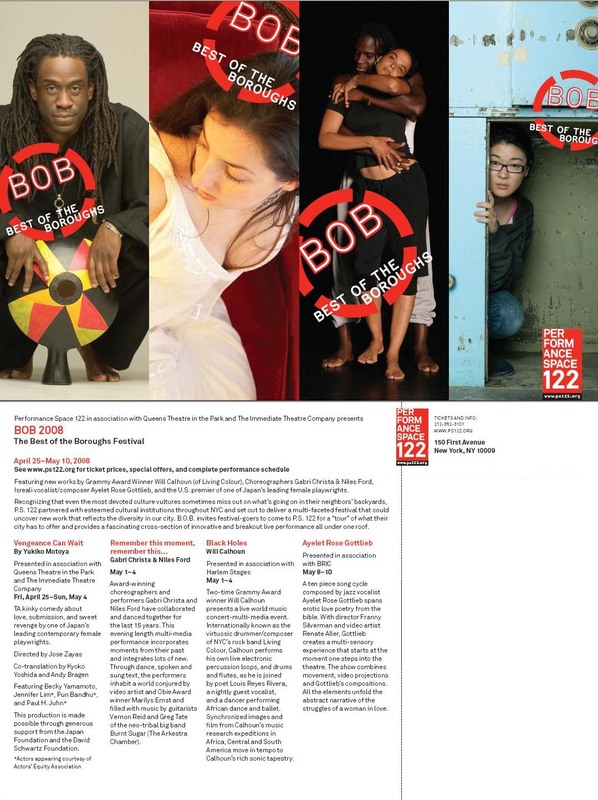 Visit www.ps122.org for ticket prices, special offers, and complete performance schedule.